ReadySetF a s h i o n: Everybody is Doing It! Sneakers With Everything! Everybody is Doing It! Sneakers With Everything! Its in the air. Sportswear for Spring is in, and its everywhere. And the key element is a good pair of kicks. Mix 'em with tulle, with chiffon, with suits, or even petticoats and leather. If you doubt it can be done, take a look below for some stand-out high-fashion sneaker combos. Maybe you are are still on the fence you could personally pull off the ultra-cool street wear look. I know some girls tend to think the finished outfit may turn out a little 'working girl.' But as long as you know how you don't want to look, you are one step ahead. Converse is the easiest of the sneaker brands to choose from. Really can't go wrong. Everyone could own a pair of the same Cons and still rock them differently. The Nike Oceania style is so in tune with the recent burst of editorials. On sale right now, so you really need to pick up a pair. Looking for some color to wear with slouchy chinos? Adidas is your best bet. Plus, Adidas styles run on the slim side, for a less bulky fit. And catch a little fresh air with Y-3. Feel like sneakers, but offer off-the-chart style in any closet! A pair is a must have for all girls. So now you are inspired and the sun is finally out. Do not let Spring pass by without a new fresh pair of kicks. One more thing, keep 'em clean so you can wear them with your Haute Couture and not your Juicy Couture! brilliantly stated....I so love a good pair of sneakers. adidas are my all time favorite...I would gladly wear haute couture (not juicy couture) with a chic pair of adidas, anyday! 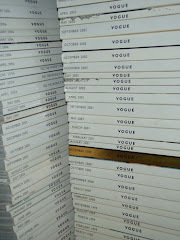 WHAT is UP with that Vogue May 2011 showing my red New Balance from 1998...Is nothing new? I mean, I always knew those shoes were that cool but sheesh. Just because J.Crew gets on board–as though there weren't any among who've been living this look all along. Sneakerheads unite! Time to dust off our shell-toes!